A Path To Lunch: Great Italian Hill Towns Near Cinque Terre for 2019. Great Italian Hill Towns Near Cinque Terre for 2019. Seven Pretty Liguria and Tuscany Hill Towns near Cinque Terre. Explore Evocative Old Italian Hill Villages with Castles & Medieval Streets. Stay In a Castle Hotel / A Hotel In an Ex-Convent / or A Room with a 10 Mile View. Good news, fellow travelers. If you thought you didn't have time to see the Cinque Terre fishing villages and an Italian hill town, you're in luck. You can easily see some wonderful hill towns as you drive to or from Cinque Terre, Lucca or Pisa. We guarantee they are authentic, evocative, pretty, historic, and five other adjectives of your choice. These seven diverse hill towns are in the border area of Tuscany and Liguria - the part of Italy referred to as Lunigiana. They sit on hills around the lower valley of the Magra River adjacent to the Mediterranean Sea and the dramatic Apuan Alps. They are much older than the Cinque Terre villages and you can enjoy them without a crowd. We recommend them all, and we've visited each many times. See our Liguria & Tuscany Hill Town Map for orientation and the Getting There section below. Italian hill towns are a fascinating example of human adaptation, so don't miss the opportunity to explore one or two to imagine and appreciate this unique way of life. They developed first and foremost for defense from attack, but continued to develop for other factors - access to pastures, escape from malaria, to control trade routes, as a visible symbol of power, and more. Modern life and modern economies have passed them by, but they are still available for you. Take the time to visit - you'll be rewarded with timeless sights and memories. Scroll down or Click the hill town name to jump to the description. Note: We use these names to refer to the Historic Center (Centro Storico). You may also see the name used on maps to refer to the larger comune. Fosdinovo Great views, good churches, and the region's best castle (and a unique hotel). Castelnuovo Magra Panoramic views and the ruin of an historic castle with a maze of lanes. Ortonovo In the foothills of the Apuan Alps, it also has a prominent sanctuary and forest paths. Nicola Occupying its own knobby hill, it's the most medieval town and has a good restaurant. Vezzano Ligure Two towns - the older perched above the valley; the newer, at age 400, is higher still. Ameglia Ex-home to the Counts of Luni, its castle is surrounded by medieval lanes and houses. Montemarcello A Roman army outpost became a movie-set-pretty Ligurian village. On our trips, we use Booking.com. We like their verified reviews, search filters, and the handy Map View. We have recommended accommodations in the sections on Fosdinovo, Castelnuovo, Vezzano Ligure, and Montemarcello. Book as early as you can - this area is very popular. In 2019, the long Easter weekend is April 20-22. Book RIGHT NOW for those weekends. See About Us and Disclosures below. These links do not affect the prices offered. Malaspina Castle in Fosdinovo Tuscany. Located on a twisty road high above Sarzana, historic Fosdinovo is visible for miles around. It's the best undiscovered hill town in Tuscany, in our opinion. The town dominates its own hill with its tiny main street running up the ridge line to a large Malaspina castle at the height of the town. You'll enjoy wandering the narrow streets, admiring the immense views, and exploring the castle and three churches. If the weather's hot, there's always a cooling breeze here. The Malaspina castle, with origins from the 11th century, is one of the area's best preserved and you will definitely enjoy it (and it's great for kids). In season it's open every day except Tuesday by scheduled guided tours, for details: Castello di Fosdinovo. The tour covers the whole castle and includes a dungeon and a dining hall with fabulous murals. You'll also learn that Dante stayed at the Castle and you can too since the castle incorporates a unique hotel: Booking.com Castello di Fosdinovo. Also nearby in walking distance from town: Booking.com Il Girasole B&B. There are three ornate churches filled with paintings and precious marble and they're all on the main street Via Roma / Via Papiriana. The parish church of San Rimigio is in 15th C. style and has an ornate Malaspina funerary monument; just behind it is the 15th C. Oratory of the Red Fraternity (Confraternita dei Rossi) with baroque decor; downhill is the 1468 Oratory of the White Fraternity (Compagnia dei Bianchi) with a blinding facade of white Carrara marble (an oratory is a church sponsored by a lay group or individuals). What a marvel that this little town could attain the splendor of these buildings. Late on any sunny day, from miles away, you can admire Castelnuovo shining in golden light on the foothills of the Apuan Alps. It can seem like an apparition, beckoning you to follow the winding road up and up through olive groves and vineyards (Vermentino grapes for the white D.O.C. Colli di Luni). We are in Liguria now, even though it's nearer to Tuscany proper than Fosdinovo (it's a long story). The town itself is surprisingly flat for a town on a hill, a maze of narrow streets and well-tended houses. You'll enjoy the wander, but don't let the modest exterior of these buildings fool you. Some are the palaces of the wealthy from the 17th and 18th century who had no need to advertise their money. The 12th castle, at the upper end of town, is the town's icon and notable for its tower and for hosting Dante, but not as a tourist. In 1306, Dante, who was a lawyer at the time, brokered a peace here between the Count/Bishop of Luni and the upstart Malaspina family. The castle is no longer whole, but enough remains to imagine more. The views from here are wonderful. The excellent late Renaissance parish church of St. Mary Magdalene is at the lower end of town. There are three naves, divided by twelve columns of white Carrara marble. In the first chapel on the left, there's a scene of Calvary attributed to Peter Bruegel the Younger. In the second altar on the left is an 18th century painting dedicated to the patron saint of Castelnuovo Magra , San Fedele - the background of which shows a view of eighteenth-century Castelnuovo Magra. Look for a Madonna by Domenico (1589-1669) and a Crucifixion attributed to Van Dyck. Castelnuovo has been accepted as one of the “Most Beautiful Villages of Italy” so we've written more in our Most Beautiful Villages of Liguria Part 7 story. Italian Hill Town of Ortonovo in Liguria near the Tuscan border. Although important to the Romans as a sentry post above Luni, the historic center of Ortonovo dates from the 11th C. After a steep and curvy climb, you'll find the town perched precariously on a curve on Mount Boscaccia. There are enjoyable little streets with idiosyncratic houses, an enormous 15th C. Guinigi family watchtower, and one of the narrower road passages you'll ever see. The large pink parish church of San Lorenzo is from 1645 and has a country feel despite the baroque. The poor building hasn't had much attention lately, but there's art and statuary to enjoy in the cool, quiet interior. More extravagant is the Sanctuary of Our Lady of Mirteto (Nostra Signora di Mirteto). This large white church is located a bit downhill from the center of Ortonovo, and it commands views of much of the valley. This is a place of pilgrimage for believers commemorating a 1537 miracle when a painting of the Madonna at the Crucifixion began to shed tears of blood. Inside there's a tempietto (a little temple) from 1796, lots of precious marble, and many votives - one of our favorite forms of folk art. Another unique feature of this hill town is that it's surrounded by forest. We've described a beautiful, peaceful hike around the slopes of Mount Boscaccia so you can enjoy the woods, old olive groves, views of the coastal plain and the Carrara quarries, the cute town of Fontia, and a country road. It takes about 90 minutes and it's an easy shady hike with only a couple of moderate short climbs: Hiking the Ortonovo Fontia Ring. We also describe a slightly more energetic nearby hike: Walking a Tuscan Forest - Ortonovo to Castelpoggio. Italian Hill Town of Nicola in Liguria near the Tuscan border. Bring your imagination and your camera to this little town, it's a gem. The streets are tiny, paved unevenly with rocks and lined with houses that are convincingly medieval. Located in the foothills above the coastal plain near Ortonovo, Nicola occupies a perfect little hill surrounded by green. The town origins are by legend in the 6th C. and by first mention in the 11th C. There are some remains of a castle and a tower, but the real attractions are the atmosphere, the good views, a cute little church and a good restaurant. The parish church of Saints Filippo & Giacomo is made special by its very humility. Small and painted bright yellow, it sits on a suitably humble piazza with statues of Saints Philip & James on its facade. It was constructed from the 15th-17th C. The inside has Baroque décor and paintings and statuary from the 1500's. Nicola's only restaurant is so good we wrote it up: Da Fiorella in Nicola. For those interested in an authentic regional restaurant that locals seek out, you don't want to miss this. Italian Hill Town of Vezzano Ligure Inferiore in Liguria near Cinque Terre. If you want undiscovered, this is it. Vezzano is where we take guests because it's so genuine, so charming, and its history is so palpable. As a bonus, there are two towns: really old Vezzano Inferiore (basso or lower) and the pretty old Vezzano Superiore (alto or upper). As you drive up, you'll encounter the lower town first. Vezzano Inferiore. This town occupies a fabulous location above the confluence of the Magra and Vara rivers with a stunning 360 degree view over the valleys. The town has been occupied since before written records, and the Ligurian tribe had a stonghold here. In the 11th C. the Lords of Vezzano, by virtue of fealty to the Bishop/Counts of Luni, controlled many of the valley towns and beyond as far as Portovenere. By the 13th C., as the Lords and feudalism itself slowly weakened, Vezzano Ligure and the surrounding areas were incorporated into the Republic of Genoa. On the piazza at the entrance to the old town is the Church of Saints Sebastian & Maria Assunta from 1602. The interior has a peaceful Baroque decor in warm golden colors. While there, note the early 18th C. Pietà of the Madonna in wood by the Genovese artist Anton Maragliona. This is an interesting example of a popular folk Baroque style that never went viral and is now mainly seen in the exaggerated figures in presepi (creches). Not far from the church you can stay in a well-rated hotel in an evocative ex-convent: Booking.com Albergo Al Convento. Driving to La Spezia Centrale train station parking for the Cinque Terre train takes 30 minutes from the hotel. The biggest attraction in the old town are the streets - narrow, twisty or straight; good decor and bad; dead ends or unexpected views. You can wander, photograph, or ponder as long as you like and the cats won't care. The large arches with a rooftop garden you may come across constitute the Porta San Giorgio, the old entrance to the town from the valley. There was a large central castle on the top of the hill, but it's greatly reduced now except for some walls incorporated into houses, a large privately owned manor house - Palazzo Giustiniani, and the very tall watch tower. The tower was built in the 12th C. with five sides for easier defense, and was connected to the castle with a 5 meter drawbridge. The Church of Our Lady of Soccorso (Rescue) in characteristic Ligurian colors decorates the approach to the upper town. The church was built to honor the Virgin who spoke to a woman from a painting in 1524 and promised protection from an outbreak of plague. Inside it's simply decorated and contains said painting showing the Madonna & Baby. The Piazza in front of the church is beautifully paved entirely with designs created with white and dark gray round cobblestones. This distinct Ligurian art form called 'risseu' is used to enhance public places. Enter the upper town through an archway off the piazza and enjoy. The village is an ellipse around a wide center main street / piazza. The homes are fairly uniform and an old style water well is in the middle of the piazza. There are various walkways leading out of the ellipse leading to views and backyards and narrow access roads. Words are poor descriptors for a really good multi-sensory travel experience so you just get this: it's really really adorable. Absolutely not to be missed is the little park around what used to be the upper castle. The views are staggering - the valley and the mountains and the town of Vezzano Inferiore are laid out before you. To get there from the well in the center of town, just walk east - away from the sea - and bear left uphill. 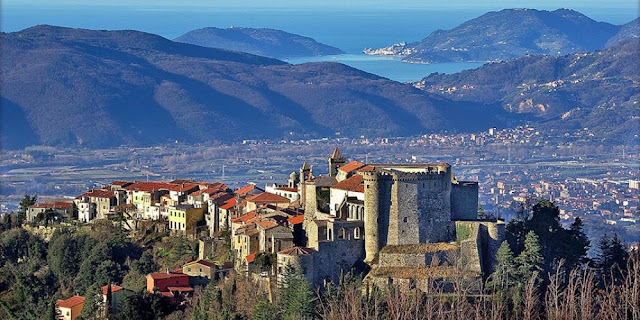 Italian Hill Town of Ameglia with its Castle & the Apuan Alps in Liguria. On a special town-sized hill in its own small valley, Ameglia has a proud look about it. And rightly so, since its castle was home to the Bishop Counts of Luni after the Roman city fell into ruin and the whole Lunigiana region was ruled from here. The castle is in the center of town and is reached by going through a grotto-style arch at the end of the old town's main square – Piazza Liberta. There are concentric rings of medieval looking streets around the castle and its companion watchtower - the oldest structure in town. The tower has only one door about 20 feet up. When trouble appeared – usually in the form of Saracen pirates – all the town folk would pile into the tower and the ladder would be pulled up. This town's layout gives evidence of the its pre-Christian origins since the church is on the periphery, and as further proof, there's a necropolis of the Ligurian tribe below the center. Walk the rings of little streets and you can peek at the residents' rooftop retreats and gardens, see old Ligurian store fronts and slate door frames, and - especially near the church and on the outer ring - enjoy the views of the little valley and the Apuan Alps. The green hills around you are part of the Montemarcello Magra Park and there are numerous hiking trails throughout. The Church of San Vicenzo is not too fancy, even though it dates from the 15th C. but there are some worthwhile artworks, including a three part marble sculpture by Domenico Gar from 1527. When you exit back through the arch, tip your hat at the plaque honoring the 15 brave American soldiers who were executed by the German army in Ameglia in WWII. We wrote about this awful, precedent-setting war crime here: Liberation Day: The Ameglia Executions. Il Paese del Vento - The Village of the Wind - rests on a less precipitous hill and has different origins than many other hill towns. It was a Roman army outpost established about 177 B.C. to protect the city of Luni on the plain to the east. The Roman commander was M. Claudius Marcellus, hence the town name. The original layout conformed to Roman army regulations with long parallel streets leading up to headquarters (near today's central piazza), few cross streets, and Roman defensive palisades which eventually became the former town walls (now streets or building walls). 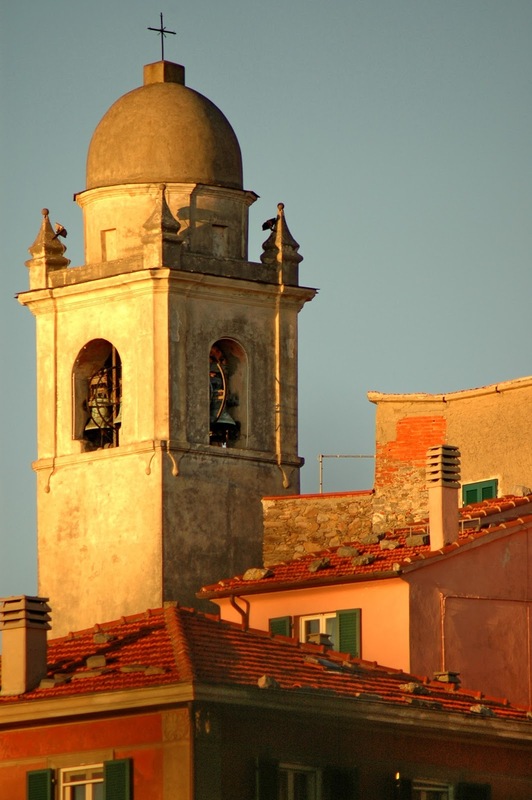 Today, Montemarcello's a well-kept prize of a village that celebrates the colors and architecture of Liguria. Most of the residents are seasonal now, but also mostly Italian. The attractions are the village itself - so cool and quiet and pretty; the parish church of San Pietro; a dramatic panoramic outlook on the Gulf of La Spezia; access to the trails and Botanical Gardens of the Montemarcello Magra Park; and access to a hidden beach famous throughout Italy - Punta Corvo. The parish Church of San Pietro dates from around 1474. It's large for a town this small, and the pleasant Ligurian pink exterior has been recently renewed. Inside the art works of note are (another) 1529 marble alterpiece by Domenico Gar, and in the first chapel on the left, a enigmatic three panel 14th century painting of the Virgin between Peter and John the Baptist. To reach the panoramic outlook, walk south and seaward from the central piazza. You'll reach the paved road near a garden cafe and across the road is the path. Follow it and fork left (the right fork leads to Punta Corvo). You can see the beach of Punta Corvo below you, and the islands of Tino & Palmaria and the town of Portovenere across the gulf. On clear days, the island of Gorgona is visible. The famed beach of Punta Corvo. Known for its dark sand, pure water, and the dramatic looming cliffs can be reached by a seriously steep path down (and up!) from Montemarcello. Many handsome young Italians do it. We did once as well, so now we tell ordinary folks to go to Fiumaretta (across from Bocca di Magra) and take the boat that runs to the beach. Montemarcello is one of the “Most Beautiful Villages of Italy” so we've written more in our Most Beautiful Villages of Liguria Part 7 story. See Liguria & Tuscany Hill Town Map for orientation. Sorry to say, but a car is the only realistic way to reach these towns. There won't be adequate road signs so you'll need a map (types discussed below). Here are one way time estimates and the autostrada exits to get you started. The A12 (or E80) is the north/south coastal autostrada Genova to Livorno/Rosignano. The A15 (or E33) is the east/west autostrada from Parma to La Spezia. SS1 Aurelia means the road designated Strada Statale 1 Via Aurelia (originally Roman!). Fosdinovo A12 Sarzana exit or A15 Santo Stefano exit. About 20 minutes. Castelnuovo Magra A12 exits Carrara or Sarzana. About 25 minutes. Ortonovo A12 exit Carrara. About 30 minutes. Nicola A12 exit Carrara. About 20 minutes. Vezzano Ligure A12 exit Sarzana 20 minutes or A15 exit Vezzano (westbound only) 10 minutes. From La Spezia SS1 Aurelia, 15 minutes. Ameglia A12 exits Carrara or Sarzana. About 15 minutes. Montemarcello A12 exits Carrara or Sarzana. About 20 minutes. More Hill Towns. If you are staying in the lower Lunigiana, there are even more hill towns for you to explore. They are mostly smaller and less historic than those above, but fascinating nonetheless. Consider: Arcola, Bolano, Caprigliola, Cerri, Falcinello, Follo Alto, La Serra (Lerici), Ponzano Superiore, Tivegno, Trebiano Magra, and Valeriano Lunense. What's the best paper map? For driving get 1:200,000 scale. We think the DeAgostini or Touring Club Italiano Touring Club Liguria Map (Amazon Link) series are clearer than Michelin. You can also buy one in Italy -larger bookstores and some autostrada rest stops have good selections, but that takes time. Should I opt for a GPS for a rental car? No - they are expensive and many feel they are less useful in Italy. They are not updated often enough and they are useless navigating ZTL's. Can I Use an App? Yes, the smartphone apps like Waze or Google Maps are very useful - but still watch for the ZTL limits. You can now download relevant Google Maps for offline use. Read this extensive discussion: Rick Steves Forum. If So, Please Use Our Links to Support Our Website. Articles: Where to Rent a Car from Cinque Terre - La Spezia, Genoa, or Pisa? We can recommend the car hire broker Auto Europe where you can compare companies, get zero deductible insurance if needed, cancel easily, and have 24/7 English customer service. If you will be renting a car, please consider helping us by using the links below (which do not affect the prices offered). See About Us & Disclosures below. We help everyone, even NY Yankees. We are Martha and Mike from Boston - recently retired photo editors who enjoy travel, food, and helping people as we've been helped. We have visited Italy for three decades, and we live in Liguria part-time. We have no connection to the car rental or hotel industries, and we receive no payments or free stuff for our writing or opinions. As is internet convention, we receive the standard commission for clicks on many of the commercial links that result in a purchase. Thus your clicks will help support this website. Written by Mike. If you find an error or omission please let us know. If you have a question, give us a try. If you don't hear back it's because we don't know or we're traveling. There's a contact form at the bottom of the page. Thanks. Ligurian Proverb: Chi si accontenta gode. Those who are content enjoy. Portovenere Travel Guide - The Top Ten Attractions Portovenere's attractions for inquiring minds. All the photos here were taken by us unless otherwise attributed. Use the Contact Box below for our free copyright permission for non-commercial uses. The attributions 'CC by' indicate photos used through a Creative Commons License. They are not altered and can be found on Flickr (Pierpeter) or Wikimedia (Papalini).